Blueberries are beautifully ornamental and highly productive. When you grow your own, you'll have a fresh-picked addition to your breakfast and a great activity ready to get children into gardening. However, blueberry plants have very particular soil needs. 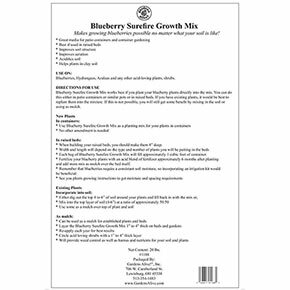 Acidic, well-draining soil is a must—or just use our Blueberry Surefire Growth Mix. For a new blueberry plant, all you need is the mix. One bag fills an 8-10 gallon container, and is specially formulated to give your new plant everything it needs. If you want to give a boost to your established blueberry plants, mix it into the surrounding soil and use it as a mulch. 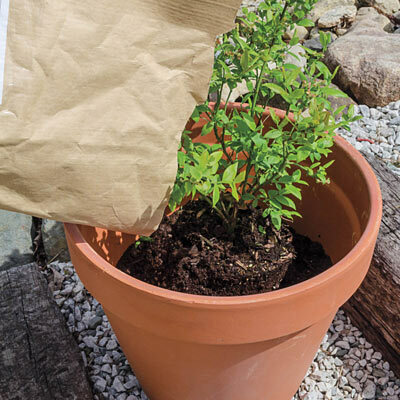 This formula makes any soil blueberry-friendly, even clay. It enhances the structure, aeration and acidity in your garden beds or containers.